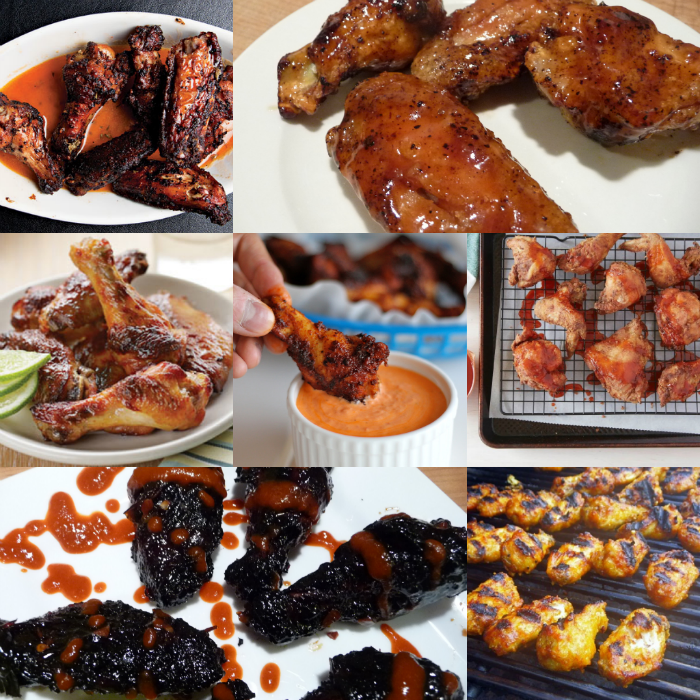 Wrapping up our Week of Wings 5 Series, we present some awesome looking wing recipes that we want try this year. Of course we’ll share our experiences with you. If you’ve stuck with us for the entire week, we thank you for reading. I’m sorry we neglected to have any grilled wings this year, but the weather has just not cooperated. Nevertheless… let’s check out these recipes together, and see if any of them become a favorite. Let us know if you try any of these. 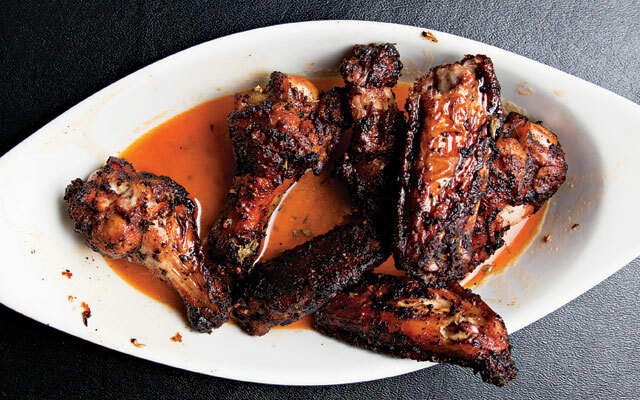 These crisp-charred chicken wings are bathed in a spiced butter sauce. Featuring 10 spices that almost everyone has in their cabinet, these grilled wings are a sight to behold. Charred with spicy butter, they look delicious! Best chicken wings I have ever made and I have cooked thousands over the last fifty years. Tangy, a little salty, and not too sweet. Prep and Cook Time: 25 minutes, plus at least 3 hours to marinate. Just like the cocktail it’s named for, this easy marinade is a four-ingredient flavor explosion of tart, sweet, and salty all rolled up into one. 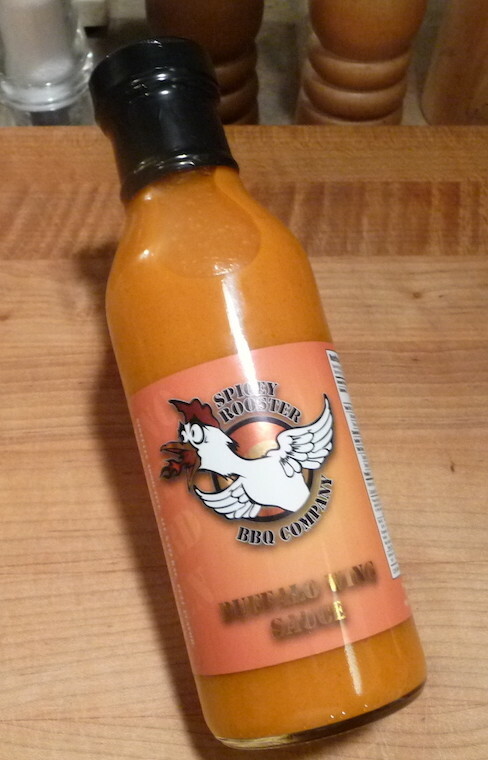 Here it’s used to jazz up chicken wings, but it works wonders for flank steak, grilled pork, and chicken thighs too. They had much so flavor, we all loved them, and they came out golden brown, like the picture. 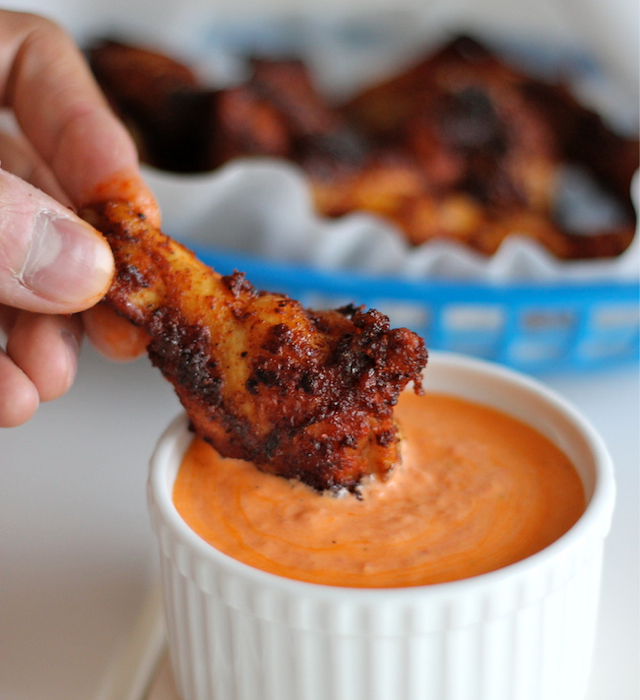 Amazingly crisp wings baked to perfection served alongside an incredibly creamy dipping sauce that everyone will love. Just tried this the other night and it was fabulous! This is my absolute favorite wings recipe. 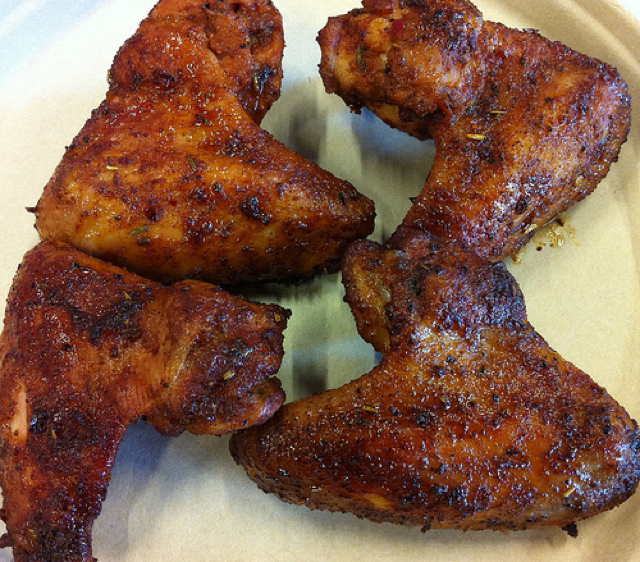 Dougherty’s Wings – arguably the best chicken wings on the planet. 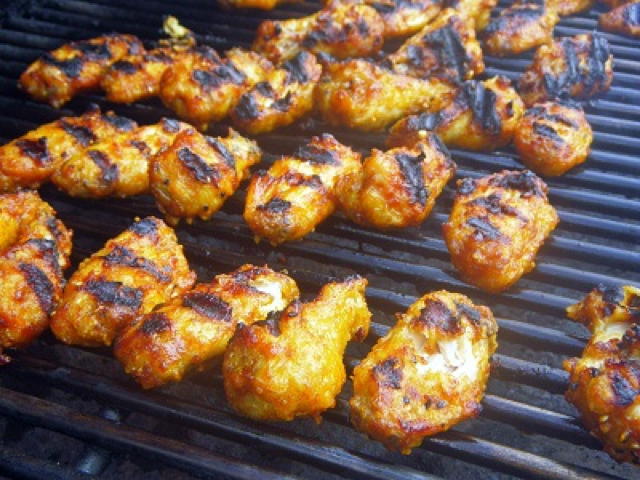 These grilled wings are seasoned with a Santa Maria seasoning and Old Bay Seasoning. They are basted with a mix of Foster’s Beer, brown sugar and Walkerswood (wet) jerk seasoning. A little complex, and a hard recipe to follow, but you Weber Kettle grillers should have no problem. 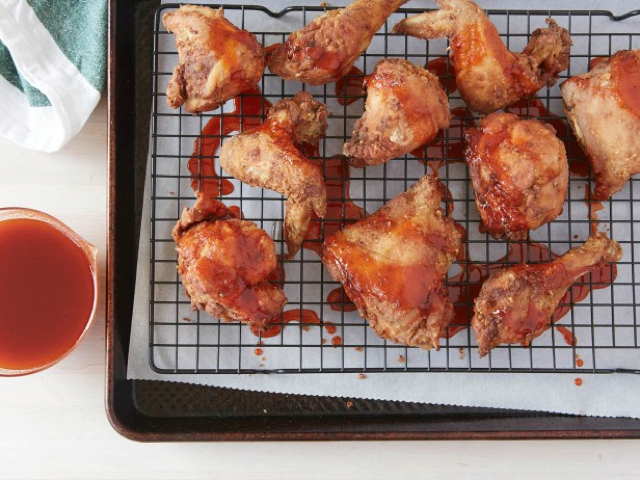 While not just for wings, this recipe features twice fried chicken with a good looking sriracha honey sauce. …the seasoning blend for the chicken is delicious! My husband wants it on cheeseburgers next! A huge hit. Don’t be afraid of this odd combo – it really works! Heat from the gift of the food gods, Sriracha Sauce – Sweet from Honey – An Earthy bite from the Bourbon. 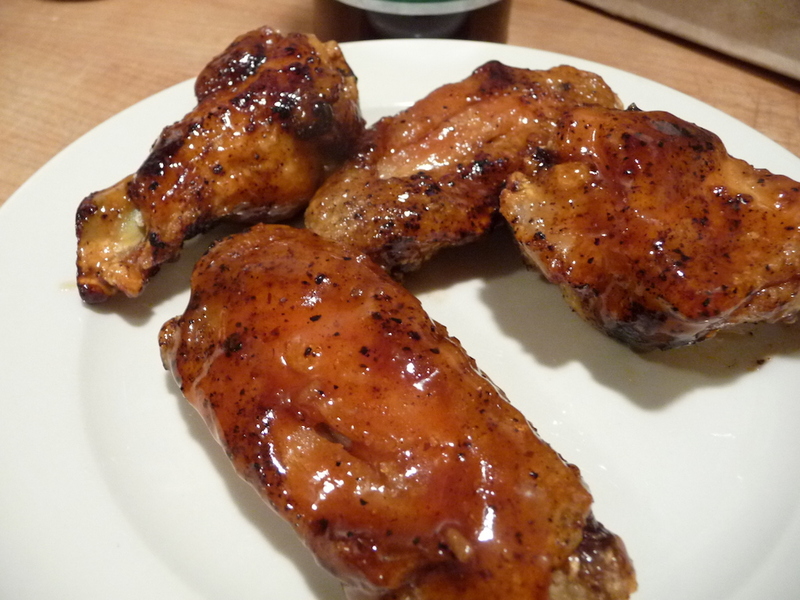 This is a great step-by-step recipe for what looks to be a delicious wing! How does Spicy Garlic Coal Black Wings grab ya? Add to that, an incredible “all purpose” sauce review that we did on wings. The Coal Black Wings make an astounding presentation (and delicious wings), and the Chili Dan’s All Purpose Sauce tied for our top product of 2013. So for all of our new readers, we finish our Week of Wings 5 with two of our very favorite wings recipes that we have cooked many times. 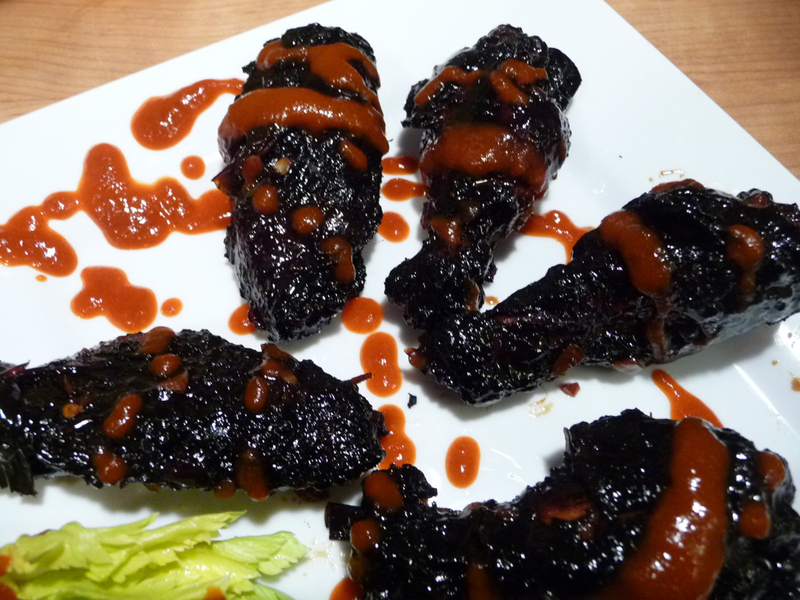 Spicy Garlic Coal Black Wings with Sriracha: A particularly complex recipe that is well worth your time to make! Just take a look! We’re especially proud of this recipe, as we put it together solely upon watching a TV show that featured it at a restaurant (details are in the original post). 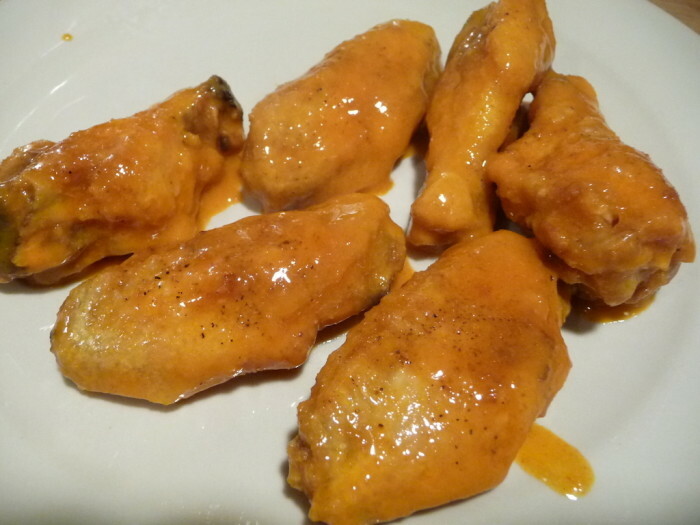 Chili Dan’s All Purpose Start to Finish Sauce Wings Recipe: One of our favorite products of 2013, Chili Dan’s on wings is spectacularly delicious! This is one of those all purpose sauces that we fell in love with immediately. We just might keep a case of this on hand at all times. It’s that good. We hope you enjoyed reading through our Week of Wings 5 series of posts, and hopefully you got some great ideas of your own. Please share anything you discovered with us and our other readers by leaving a Comment below. 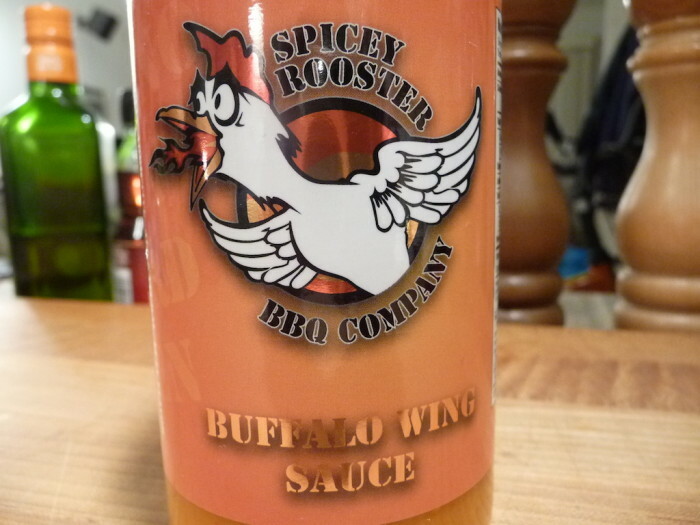 Our Week of Wings 5 continues on Day 3 with Buffalo Wing Sauce from Spicey Rooster. Week of Wings 5 – Day 3. We’re still in the land of “mild” wing sauces with Spicey Rooster BBQ Company’s Buffalo Wing Sauce today, although upping the heat a notch. Coincidentally, Randy and Gloria Combs are also from Ohio, as were Sam and Joyce from Day 1’s Sissy Sally post. Spicey Rooster BBQ Company’s motto is “This ain’t your ordinary barnyard chicken”. Let’s see what their Buffalo Wing Sauce does to our chicken as it was published. What we eat is what we are, right? However, do not forget your teeth, they are also part of your digestive system. Ingredients: aged cayenne peppers, vinegar, soy oil, hydrogenated soy oil, soy lecithin, water, salt, garlic, onion, sugar, natural flavor, horseradish, lemon, spices, citric acid. I’m liking the addition of horseradish and lemon that help “brighten up” the overall flavor of this sauce. I’m puzzled by all the soy products, and suspect that’s how this sauce gets its bright color. Texture and Appearance: On the medium-thin side, this smooth sauce is bright orange in color. Marilyn thinks it’s a classic buffalo sauce color with a creamy looking finish. On the wings, the sauce sets up as a medium thick coat with a light shiny finish. It tends to sit on top of the wings, yielding a very wet wing… and the overall coating reduces the crispiness of the deep-fried skin. Hearty and handsome. 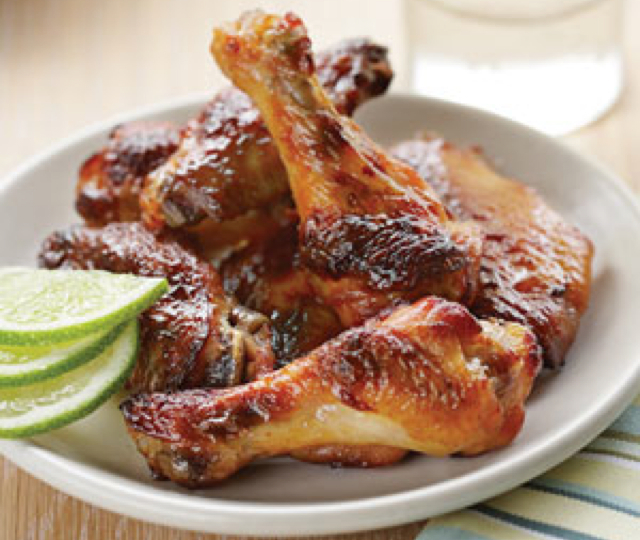 Taste on wings: Very tangy, very little sweetness. First up is the classic cayenne flavor, followed by the vinegar tang. Again, a classic taste that is also not too vinegary here. Since we eat with our eyes too, the orange color has me expecting to taste some butter or even mustard, but the soy is doing its job to bring on the “buttery” consistency and flavor. Enjoyable. Heat Level: – Just a tad above mild. Typical of a mild buffalo wing at your local bar. The heat does build ever so slightly as you eat more, yet never reaches beyond the short range of 1 – 1.5. Mildly spicy. 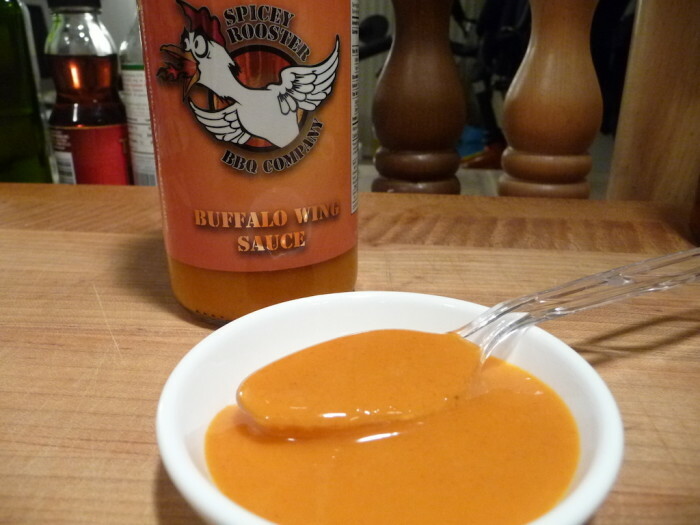 Overall rating: – While certainly tangy and zingy in overall flavor, with a mild heat level, Spicey Rooster’s Buffalo Wing Sauce is fine as bottled sauces go. We can see this sauce on your grocer’s shelves. Its classic taste (sans butter) would appeal to everyone at your party or game day gathering. Above average. Marilyn met Randy and Gloria Combs at Jungle Jim’s in Ohio in 2013, and proudly brought home a bottle of their Hysteria Hot Sauce – which we think highly of, and need to get around to reviewing. While Spicey Rooster is in a state a flux regarding their website and online store, the best way to order their Buffalo Wing Sauce is to simply email Randy at [email protected] – at only $6 per 12 ounce bottle, we think it’s a good deal. And why not throw in a bottle of Hysteria Hot Sauce for a fun surprise? Social Media: Follow Spicey Rooster on Facebook.